Monte is a small village set high up in the mountains above Funchal, a magical place that was originally designed as a retreat for the Madeiran wealthy to escape the heat of summer. It is a must on a short trip to Madeira and easy to do in a day, with time still left in the evening to feast on a leisurely seafood meal on one of Funchal’s beautiful tree lined boulevards. We reached Monte via gondola lift from the waterfront in Funchal old town; the hair-raising ride allowed us to take in the breathtaking views of the island as the gondola ascended. The lift starts with a lazy climb out of the town towards the mountains, over buildings and cobbled streets, seeming (sometimes alarmingly so) to just miss skimming the rustic terracotta tiles on roofs. It’s slow and puttering progress means that at times you seem to be hanging between the buildings on either side of the street, flapping like the washing that can be seen strewn from windows. After passing over the old town, however, the gondola starts its climb up the side of steep mountains, above largely green but sparse vegetation, but with an amazing view of the sea and the steep rocky cliffs behind. When you arrive in Monte, it is immediately obvious why this was chosen as a summer time retreat: the air is cooler and crisper and pathways are enveloped by large leafy trees that offer protection from the scorching heat. The more secluded and shaded pathways cast a shadow over the ground and it easy to forget that far below the town is bathed in sunshine and busy with the thousands of tourists that visit the island every year. 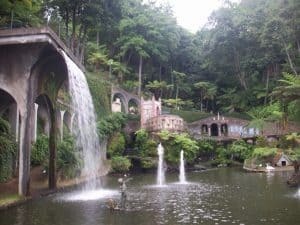 You can take in several attractions on your stop in Monte, but the one not to miss is the Monte Jardim Tropical Palace, a large tropical garden set around a number of Quintas (traditional Portuguese country manor houses and villas) and showcasing an eclectic mix of exotic plants, flowers and trees. You can find the garden via a short visit to Nossa Senhora do Monte, a beautiful black and white church perched at top of a series of steps with a floating canapé roof made of strips of red, yellow and green flowers; this bright and colourful touch gives a welcoming and festive feel and is best viewed from the vantage point open at the top of the church. When you reach the garden, you need to pay an entrance fee and follow a steep path downwards. You’ll pass walls adorned with Portuguese and Moorish style mosiacs, which lead to a suspended walkway which provides a path through overhanging plants and trees. 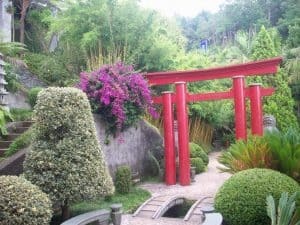 Large plants and a small stream with koi carp surround more pathways with red railings, and a red Japanese torii gate and temple appear amongst them; this is the oriental part of the park, and in true Japanese zen style, it offers a relaxing environment to sit down and take in the world. 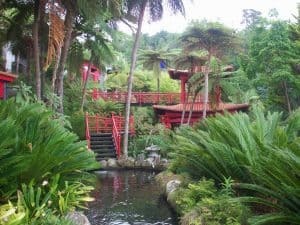 As you move further into the park, you cross more pathways and bridges and you see the beautiful plants and flowers that Madeira is so famed for are everywhere (there’s a reason why the island is described as the “floating garden of the Atlantic”). Descending further, you reach a small platform that overlooks perhaps the highlight of the garden: a large lake – aptly named Swan Lake given the swans gracefully adorning it – surrounded with Italian villa-style white structures, waterfalls flowing into it and small statues and islands docked at various points within it. Climbing down to the lakeside, you can see that one such island is actually a duck house; this gives the opportunity to sit on the waterside benches watching the birds going in and out of the water (if you’re lucky like us, you may even get to see baby ducklings!). Continuing on, you discover Monte Palace, a large imposing building surrounded by palm trees, looking less like a traditional palace than a Caribbean style farmhouse. In the early part of the twentieth century, it was apparently a hotel, Swan Lake and the fountains being used by the guests for recreation. This is just one of several houses in the park that you’ll be able to view if you have the time; there is also a museum housing sculptures and minerals and housed in a modern structure nestled between the trees. Reluctantly I had to leave the gardens after a few hours and wished I could have seen more. However, my short time here was enough to leave a lasting impression on me: aside from the sheer size of the park and the outstanding mix of plants and artefacts within it, the overriding sense I was left with was a sense of calm and peace; everything was incredibly quiet, the only sounds were those of birds and animals rustling in the trees and bushes, and the waterfalls plunging into lakes and streams. If you’re looking for a trip that’s a world away from the hustle and bustle of your everyday busy life, then you’ve found it. This park is wonderful; magical may be a cliché, but that’s really what this is. 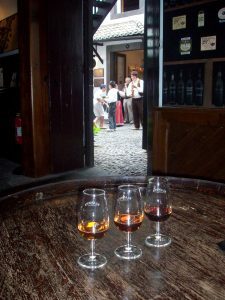 Read on for practical information for a trip to Madeira…. – Getting there: You can fly direct from the UK (London, Birmingham and Manchester) with carriers such as British Airways, Monarch, Jet2 and Easyjet. There are also direct flights from other Portugese destinations such as Lisbon, Porto and The Azores with Transavia, TAP, SATA and Easyjet (giving a possible opportunity for a multi-centred Portugese trip when you have more time?). There are also direct flights from Brussels with Tuifly. 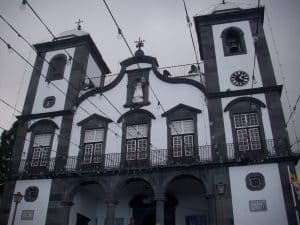 – Accommodation: Madeira has really embraced tourism, so there’s no shortage of accommodation, much of it along the beautiful and rugged coastline. You could also stay in a Quinta or Quintana as we did – old beautiful Portuguese country houses with lovely tranquil gardens and often a swimming pool. These are a real treat, but they can be a bit more expensive than standard hotel type accommodation and are often not on the actual sea front. Note that because of the terrain in Madeira this means they may be located up steep slopes away from the town centre, and may not be suitable for people with mobility problems. 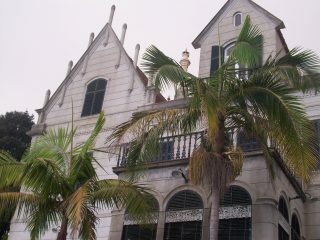 – The climate: Our experience is that it is very true that there are microclimates in Madeira. Whilst this means that there may be disappointing periods on some days (unless our time was particularly unpredictable! ), it does mean that within a relatively short time, the weather has changed, hopefully for the better! – Food and drink: Meals tend to focus on fish and pork and can be cheap, depending on where you choose to eat. Even in the old town, food can be relatively cheap when you take into account the fact that you’re in the tourist centre (which is beautiful in Funchal) and likely to be sitting outside on a beautiful terrace or overlooking the sea eating the freshest food. If you drink alcohol, you must try Madeiran wine. For me, it was a cross between sherry, port and brandy. If you want to try different varieties of the wine, you can partake in a wine tasting session in The Old Blandy’s Wine Lodge (plus if you’re there early September as we were you may coincide with the annual wine festival). This looks like paradise! And it feels like one might want to spend longer there. Still – how wonderful, that one can see and experience it on a time budget, too!